Five-light chandelier with white etched glass from the Bravo collection. Linear elements stream throughout the fixture to compose a relaxed but exotic ambiance. Generously scaled glass shades add distinction against the Antique Bronze finish and provide pleasing illumination to your room. Bravo possesses a smart simplicity to complement today's home entirely with confidence and style. Five-light chandelier from Gather possesses a smart simplicity to complement today's home. Antique Bronze metal arms descend downwards and curve sharply to prop white etched glass shades. Etched glass add distinction and provide pleasing illumination to your room. Coordinating fixtures from this collection let you decorate an entire home with confidence and style. Gleeful simplicity defines this five-light chandelier from the Joy Collection. Refreshing and fashionable arcing forms of Antique Bronze metal arms enhance the etched white fluted glass. Coordinating fixtures from this collection let you decorate an entire home with confidence and style. Unique stem-hung construction carries the clean line all the way to the ceiling and, for sloped ceilings, six feet of 9 gauge chain is provided to allow the fixture to hang straight and level. 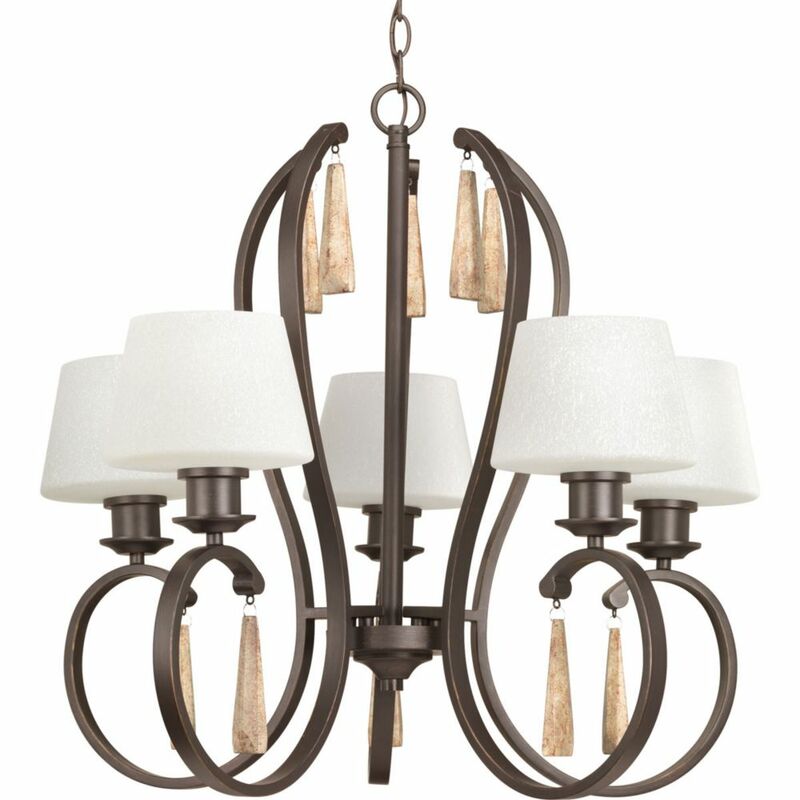 Club Collection 5-Light Antique Bronze Chandelier The Club collection is reminiscent of a 1930's English hunting lodge bespoke sophistication and luxury. Smoky tea-stained glass provides warmth and even light diffusion to contrast with the handsome bronze frame. Jewel-like pendants in a neutral distressed finish add even more panache for an elegant and well dressed effect to your home.